I sigh with longing whenever a California friend tells me about a homestyle Mexican meal from some no-atmosphere place in an LA strip mall with handmade tortillas and chile rellenos. My friend Stacey got tired of my whining about the Mexican food desert in Massachusetts and generously sent me Rick Bayless’s Mexican Kitchen last fall. I dove right in, making sauces, beans, and tacos for some rather festive Saturday night dinner parties. Many of these dishes were built from Bayless’s Essential Quick-Cooked Tomato-Chipotle Sauce, which he also recommends as a base for chilaquiles (sauce + tortilla chips+ cheese=yum) and huevos rancheros. I didn’t make either, thinking they were too casual for a dinner party. So I had huevos rancheros on the brain. I also had stashed in the freezer some extra batches of the sauce that I made after a Costco frenzy left me with pounds of fresh tomatoes. When I saw a recipe for migas (eggs, chorizo, tortilla chips) with a tomato chipotle coulis in the Smitten Kitchen archives, it seemed like the perfect addition to a plate of refried beans. In a medium-sized skillet or saucepan, heat the oil on medium heat, and add onions. Cook until softened, stirring occasionally, about 5 minutes until soft. Add beans, 3 TBS water, and cumin, and cook at medium heat, 10-15 minutes, stirring occasionally and adding more water if needed. Add salt and pepper to taste. Beans should get soft enough that you can mash them with the back of a wooden spoon. In a large skillet, add canola or other neutral oil so there’s about a half inch of oil in the pan. Saute the tortilla wedges in batches until they are golden brown, and then put on a paper towels to drain. Salt the chips. This next part goes fast, so it’s best to have the bowls ready: Put a scoop of refried beans at the bottom of each bowl, and add the tomato sauce around the edges of the beans. Heat a nonstick skillet on medium heat, add a pat of butter or a swig of olive oil, and add eggs and chips. Break up chips and gently scramble the eggs, adding salt and taking care to not overcook the eggs. When nearly done, spoon the eggs over the prepared bowls of beans, and top with peppers (if using), cilantro, and cheese. Add freshly ground pepper and salt to taste. 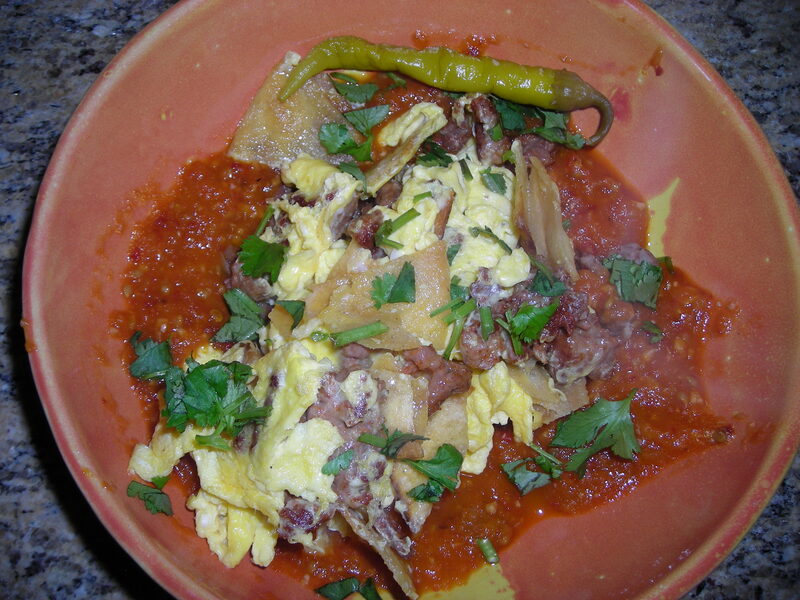 This entry was posted in Breakfast, Comfort food, Mexican and tagged Bayless, eggs, Mexican by Amy. Bookmark the permalink. What a cool blog! Vegan though I am, I found myself salivating over your engaging food musings over some of my favorite ingredients. Keep it going sweetie pie. I’m looking forward to your visit when we can cook together and compose something irresistibly and tantalizingly impossible to resist.